One word I would normally not use to describe my style would be feminine. However, that is exactly how this looks and I am in love! Something about how the colors in this romper, the pom-pom edges, and pink wedges all look together just screams girly to me. These wedges are the begonia wedges from Bearpaw. I have them in blue (styled here) and am obsessed! They are some of the comfiest shoes I own. The Begonia is currently sold out but they still have two colors available in the Blossom style! I hope you all have been having a good week! Monday night was dedicated to watching the Bachelorette, last night I went to Happy Hour with some gals from work, and Thursday we are heading to the Royals game. Thanks for stopping by! One of the most recent wedding decisions I have made is what my bridesmaids will be wearing! I am super excited today to share with you all the process of picking out the dresses : ). I selected bridesmaid dresses from Weddington Way. I found the website when I was searching for a discount code on a Donna Morgan dress I had fallen in love with. I was convinced this was the dress I was going choose; and my sister even tried it on while we were wedding dress shopping! The problem was that they were about $50 more than I wanted to ask my bridesmaids to spend. Luckily, they had a promo code for the fourth of July to take down the price of the dress! However, as I browsed the website I fell in love with an entirely different dress! When I found a dress I loved I was able to create a showroom. 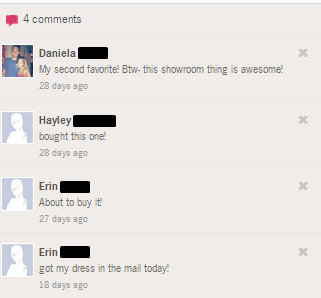 The showroom was amazing because all of my bridesmaids are spread out over three different states! In it, I was able to choose my top dresses. Each bridesmaid was able to say whether they liked it or not, which one was their favorite, etc! It was so helpful to have one spot to share everything, rather than have to communicate over email or text! Now, I am not going to go into detail about which dress I ordered or what color -- because that needs to be a surprise at the wedding! However, I will tell you I ordered from the Exclusive Weddington Way Collection. Let me tell you, I am obsessed with the dress (to the point where I want to be a bridesmaid in a wedding where I can wear one haha)! So, what do I love about it? 1. The color: it is perfect and exactly what I was looking for. Each bridesmaid actually told me she loved the color of the dress! 2. The material: it looks sophisticated but is still comfy. It is not the typical chiffon or satin bridesmaid dress, which I love. I was able to order a free color swatch to make sure I liked the material and color before ordering the dresses, too. 4. Price: A dress under $150... I was happy! I didn't know anyone who had ordered through Weddington Way before so I was a little nervous to order through the. I was comforted though because they had free shipping and free returns. I figured if we hated them we did not have anything to lose! I am so glad I took the risk. I could not be happier with the dresses! They shipped quickly and were shipped in a garment a bag. I had no idea they did that, and was super impressed when one of my bridesmaids sent me a picture of how it arrived! If you are shopping for bridesmaids dresses, I highly recommend you check out Weddington Way! If you are not a fan of the Weddington Way brand, just remember the website when you are shopping. I stumbled across the website when searching for a promo code for an entirely different brand of dresses! They were the only place I could find any sort of discount on bridesmaid dresses. I was so excited and I know my bridesmaids appreciated the savings! I can't wait to show you all the dresses I picked out. A post will be coming soon with a wedding update about all the things we have accomplished lately. I just thought this needed its' own dedicated post! This is not a sponsored post. I contacted Weddington Way after we ordered and loved the dresses about writing a blog post. They offered my bridesmaids a refund on a portion of their dress in exchange for this post. One part of my wardrobe I have been working on upgrading lately is my workout wear. I normally used to just wear old t-shirts, but since I am working on making a t-shirt quilt my t-shirt supply has drastically dwindled! My go-to store for purchasing workout clothes is Gap. I love their workout line, GapFit, because they have so many choices and they are all reasonably priced! I have never paid full price for their items because they constantly have discounts. (Right now you can take 40% off your whole purchase!) In addition to the outfit above, I have some of their leggings and other tank tops. Ever since switching to actual athletic clothing I can tell such a difference. When I wear old t-shirts now, I feel so sweaty as compared to breathable clothing. If you have never checked out their workout line, I highly recommend it. I have never purchased anything from Lululemon (so I can't compare it to that line) but I seriously am so pleased with all of their pieces! Currently I am crushing hard on the striped long-sleeve hoodie and the double-layer scooped tank. Linking up today with More Pieces of Me and On the Daily Express. This is not a sponsored post. I truly believe in the GapFit line and wanted to share how much I love the brand with my readers! All opinions are my own. One of the very first things I pinned on Pinterest was an outfit with leopard shorts. I have been wanting them ever since, but I could never find any! Luckily, Swell had multiple options for me to choose from. (Seriously, they have more than three options!) I have so many styling ideas such as a bright green top or a denim jacket. Also, I uploaded a new video to my Youtube Channel and would love if you would check it out! 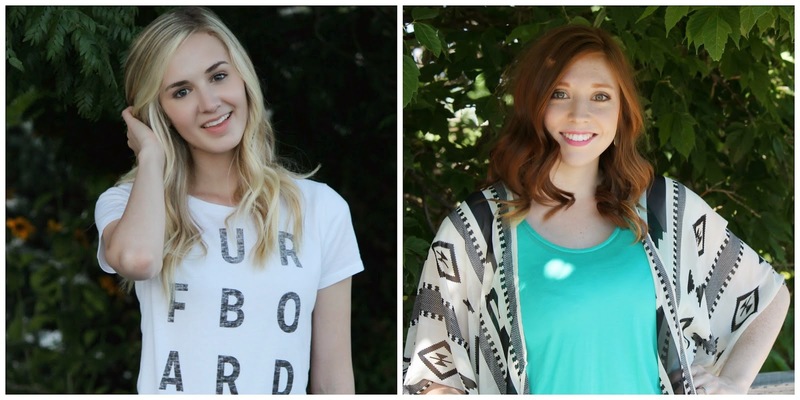 It is the Summer Lovin' Tag where I talk about some things I am loving this Summer! Today's look is more dressed up than normal, and has me wishing I had somewhere fancy to go to ASAP! (How perfect would this be for a Summer wedding!?) Coral is a shade of color I love, but I don't really have a lot of it in my wardrobe. When I stumbled across this dress from Viva La Jewels, I knew I had to have it! I love the beading on top; it is so unique! Since that detailing adds a touch of sparkle I kept the rest of the accessories simple. Studs and a silver pendant were all it took to dress up this look! To keep the focus on the dress I pulled my hair into a side sock bun. All I wish I had to add to this look is a leopard clutch (like this Express one). Also, yesterday I was featured on Everyday Southern Prep! Sydney was so sweet and interviewed me for Tea Talk Tuesday. Be sure to check it out! It is no secret that I have a major romper obsession. However, all of the ones I have are a little fancier so I have been on the lookout for a more casual one. It has actually been on my wishlist since Memorial Day (I hoped I would find an awesome deal during all the sales)! I had been wanting a casual one I could wear out, but that could also work as a cute cover up for the pool. I never found one, until I came across the rompers from Swell. This one is perfect both occasions! I love the color palette and the fun pattern. I think the solid sides are extremely flattering, too. If you aren't a color person, it also comes in a more neutral palette. I wore this on Sunday for a lunch date with Tyler. Normally I would throw on a layer or something, but it was unbelievably hot outside! Simple accessories from Stella and Dot were all it took to complete this look. Don't you just love how a layer can completely change up the look of an outfit? I normally wear this dress with a blazer, but decided to make it more casual by adding a denim vest. I feel like it completely changes up the look of the outfit! Tyler and I are headed to the Missouri State Fair in a couple of weeks and I am thinking I may need to recreate this outfit with some cowboy boots ;). Shout out if you know what movie this title is referencing. How freakin' cute are those shorts from Lookbook store? I cannot get enough of them. Fun shorts + a nice top is becoming my go-to Summer outfit. I normally don't gravitate towards shorts mainly because I can't wear them Monday - Friday from 8-5. I like to purchase dresses or skirts since I can get more use out of them. However, there have been way so many cute shorts available this year, like these floral shorts, that I just could not pass them up! I have talked before about my love for YouTube videos and finally decided to try it myself. It was different for me, but I honestly loved the process! It was fun to edit the video and see it all come together. I am planning on filming more, so please subscribe to my channel if you are a YouTube fan, too! Also I know there are some bloggers who have a YouTube channel, too. If you are one, comment on the video so I can be sure to check out your channel! Only two days left to enter the giveaway for the Rebecca Minkoff Marlowe Mini! When kimonos first started popping up in the fashion world, I was not so sure about them. I thought they were cute but never really found one that I needed in my wardrobe. That all changed when I laid eyes on this beauty from White Buffalo Boutique! The material of the kimono is so soft, and it really is the perfect layer for warm summer days. I wore this look for a lunch date with Tyler over the weekend. It was hot outside, but I am always cold in a restaurant! I also love the pom-pom edges on this. They give this kimono a super unique look! Don't forget you can use code "MEMORY20" for 20% off your purchase price! Before you go, be sure to enter the giveaway for a Rebecca Minkoff Marlowe Mini! I am going to keep it short and sweet on the outfit today, because there are more exciting things to talk about... like this fabulous giveaway I am a part of! I am teaming up with 13 other fabulous bloggers to give away a Rebecca Minkoff Marlowe Mini in Mint! See how you can enter below!